Fun, fitness and fresh air are all enjoyed during a vigorous ride, and those moments are uniquely captured in the bicycle female personalized Christmas ornament in pretty pink and blue. Each of these hobby ornaments personalized to boost their significance is lettered by hand in an attractive font and outfitted with a holiday cord for easy display. 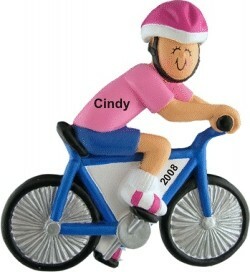 Share the joy of the ride with your favorite gal and the female bicyclist personalized Christmas ornament in our plush velvet gift and storage bag.